I recognize these as Tenkara flies (although who really cares, right?) Do these fish any differently than traditional wet flies? Howard I fish them the same way I fish traditional soft hackles wets. The reverse hackle does add a great deal of movement. I've never tied a reverse hackled fly. Looking at them, they just look like they would become very alive in the water... Almost like the skirt on a jig or spinnerbait that one would toss on traditional gear for bass. With a "reverse" start the skirt pulses and moves much more than one tied straight. In the water do you feel these forward tied flies do that as well? Will you are right. They offer much more movement, which leads to more strikes. When fished there is no difference in the feel. All right all right, you've convinced me. Tying some tonight. Flinging them this weekend. I'm glad your going to take the plunge. And please let us know how you make out. Another case of the infinite variety of patterns out there. I've heard of Tenkara but have never seen a reverse hackled fly. Thanks for the inspiration. John the flies are nice to look at, easy to tie and they work. Bill fished on a dead drift with a conventional fly rod would be deadly. And it is one way of fishing them. Nice Ties! Looks like someone has been bitten by the "sakasa kebari bug". Chris maybe so. They are so nice looking as well as effective. Beautiful flies! Are you wrapping the wood duck or just tying some fibers on top of the hook facing out over the eye? Are you also wire wrapping the bodies? Adam I tie in a half dozen fibers on top of the hook facing out. The body is wrapped with thread that has been colored with a magic marker. Great looking flies, Alan. Are they hard to tie on to one's leader? Any tricks on doing that, because I want to add a few to my arsenal? Sam they present no problem in tying on. Just stroke the fibers back and the eye is exposed. Understood, Alan, and thank you for the tip. That style of fly will be attempted soon. Brad I'm going to experiment with several different colors, and even a few wild colors. 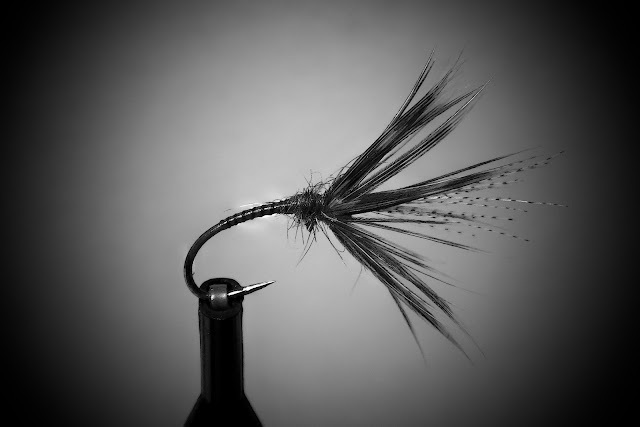 The idea came from a fly that I saw tied by Davie McPhail. I really like the dubbed collar on your versions. 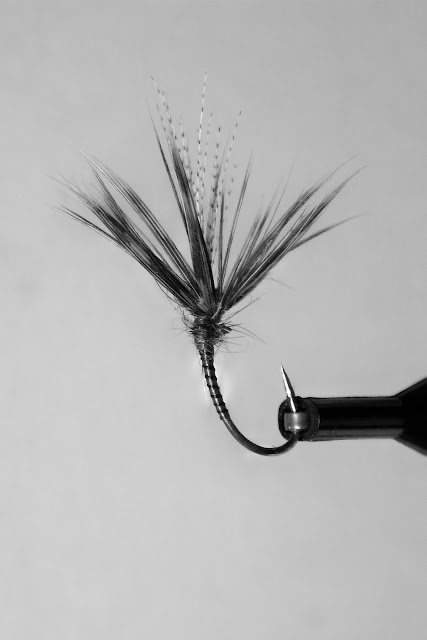 I substitute a few strands of peacock herl, but find the same style of fly ridiculously effective. Mike peacock is a great material, a trout magnet sort of. The dubbing gives the tyer more options as far as color, and if dubbed right will produce that "breathing" effect. Really enjoy these, and I'm with, Howard. When I see these, I think of Tenkara, but who really cares ha. I'd totally fish that black one. The bluegill and small bass in some of my ponds and creeks would love to meet that one. Justin you are correct, it's a tenkara fly, but it can be used as any other wet fly. I'm sure it would be a wonderful fly for most fish, well maybe not pike, but who knows. Enjoyed the patterns. Thanks much for sharing the article. I really like your take on the Sakasa style Kebaris. They are like a beautiful hybrid of the eastern and western styles of fly tying. I particularly like how you used the accent of the wood duck, which in some ways makes me think of this as a more "catskill" style Tenkara fly. I'd love to see how you incorporate that into the tying of it, do you tie in a few barbules, or just a single wrap of the feather around the hook maybe?